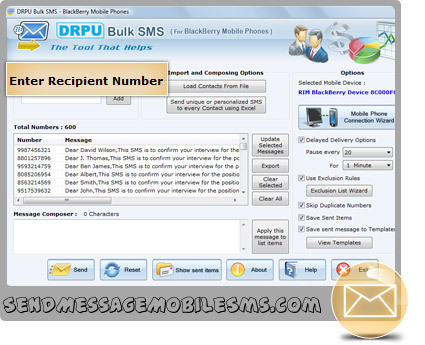 BlackBerry SMS messaging software helps you to send multiple text messages from computer using blackberry mobile phones. Bulk text messaging program conveniently composes and send multiple text messages simultaneously via BlackBerry mobiles without internet connection required. Now you can easily send group text messages and communicate with your friends, family members and clients with easy to use BlackBerry bulk SMS sender program. Why this software is so special? ◉ Allows user to send multiple text messages from computer using blackberry mobile phones. ◉ Provides facility to skip duplicate number entries during the message sending procedure. ◉ Provides inbuilt delay delivery option to control the load of bulk SMS broadcasting. ◉ No internet connection is required to send bulk text messages by software. ◉ Allows user to save sent message details that can be viewed by the users. ◉ Provides inbuilt list wizard option to maintain the list of contacts or groups. ◉ Enables user to use templates with option to add templates or edit existing templates during the message sending procedure. ◉ Provides facility to send standard message or notification. → Event notification and much more. → Provides affordable and convenient solution to communicate with different people. → Provides cost-effective way to market your product, brands and services. → Helps you to send invitations to your friends and relatives on various occasions. → Fulfills your desired mobile marketing needs at cost-effective price.